Sylvia was called to serve as the choir director at First Presbyterian Church Griffin in 1988 when she and her husband, Gary Hollums moved to Griffin after his retirement from the United States Air Force. Sylvia earned her Bachelor’s degree in music education at the University of Georgia. Her first choir director’s position was at the Friendship Christian Church (Disciples of Christ) in Athens, Georgia. Throughout their many travels in the Air Force, she served as choir director at various churches and base chapels, including the Rhein Main Air Base Chapel in Frankfurt, Germany. She recounted that including the 25 plus years she has served as the choir director here, she has directed or participated in choirs for over 50 years. She believes that music brings our spirits closer to God in many ways, for as the Psalmist says, “Make a joyful noise unto the LORD, all ye lands. Serve the LORD with gladness: come before his presence with singing.” God has blessed our congregation with wonderfully talented singers and musicians who love to serve the Lord by sharing their God given talents! She and Gary have two awesome sons, two fabulous daughters-in-law, four terrific grandchildren and one great grandchild! 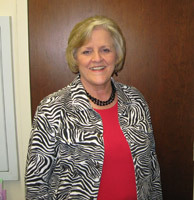 Sylvia has served as the Tax Commissioner of Spalding County since 1994.